Thanks to my friend Patti P. for this lovely award. 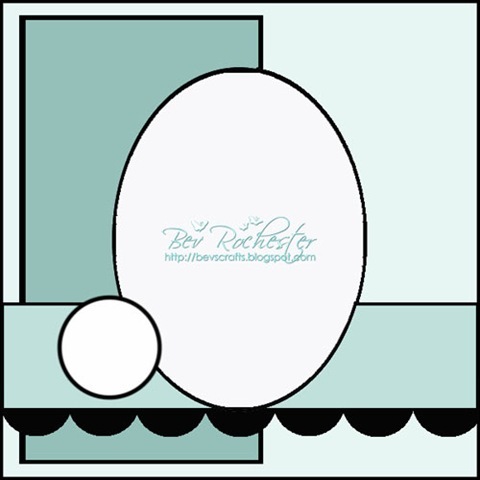 Please check her own lovely blog Patti's Paper Creations. I so enjoy seeing all her beautiful creations. Please do drop by to visit her and give her some love. 1. Thank the person presenting -this is the easy part. Thanks again, Patti. 1. That I am married to the most wonderful husband. 2. That I have met so many wonderful friends in blogland. 3. That I have health, happiness, friends and family. That probably counts for more than one but they all go together? Now for the hard part...how to only choose 7 deserving people for this reward! This I find so difficult to do because there are so many who deserve it and some of you have already received it. 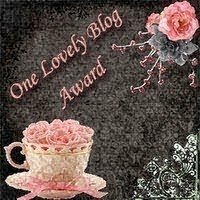 I would like to offer this award to anyone who visits me and has not already been awarded this lovely vintage badge because you all have such lovely blogs. Cannot believe this is the last day of August and today is the last day for getting in my fifth card in for August at Christmas Cards Year Round. Nothing like waiting til the last minute. The theme this month is Snowflakes. 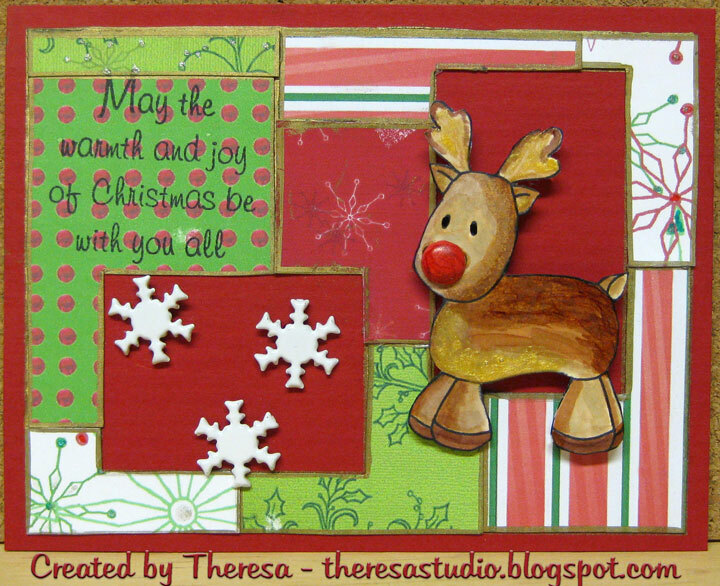 I made this card with a digital image of Rudolph from an my digi files...thought I had it identified...if anyone recognizes it, please let me know so I can give credit to the source. Colored the image with Copics, added some stickles, and a red brad for his shiny nose. Used scraps to paper piece the Inspiration Mosaic layout...outlined scraps with gold ink and added some sparkle with a glitter pen. Popped up with Rudolph with pop up dots. Added snowflakes brads and stamped the sentiment. ABC Christmas Challenge: R for Rudolph and use brads. 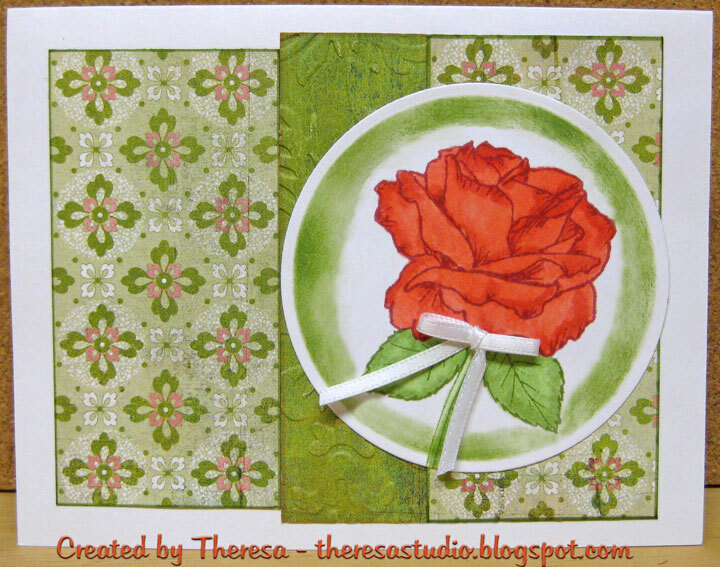 Creative Clear Stamps "Holiday Sentiments"
This card was made for challenges to use a rose, for sponging inside a die and for a sketch challenge. I used a rose stamp from GKD "A Year of Flowers" by Melanie that I stamped with Memento Rhubarb Stalk ink and Bamboo Leaves ink and colored with Copics. I cut the image out with a Nesties circle die and sponged around the image with Bamboo Leaves ink while it was still in the die. 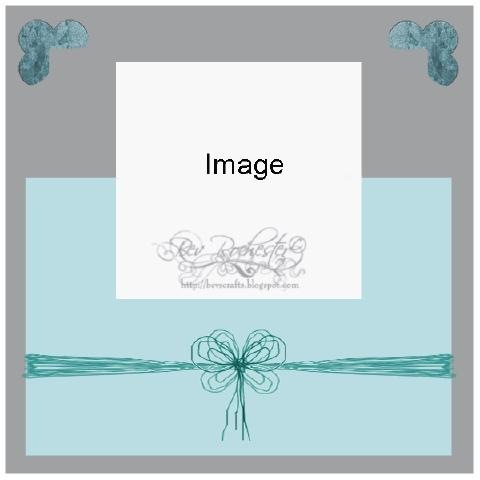 Following the sketch on the right, I used mats of Basic Grey Olivia floral pattern paper and Oliver distressed green paper that I embossed with CB EF Victoria and assembled the card. I used a white CS for the base card. Added a white ribbon to finish. 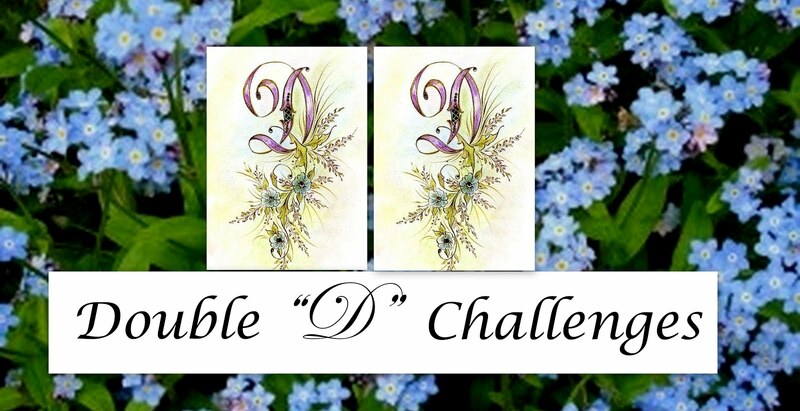 Alphabet Challenges: R is for Roses. STV Challenge: Highlight using nesties. There's Magic in this Happy Snail! At There's Magic in the Air, Jessie brings us this week's challenge. She wants us to get out those punches and use any type of punch on our project and to use the free image provided "Joyful Ride" by Paper Cupcakes. I chose to ue a border punch, butterfly punch and the nesties circles and rectangle dies (is that considered a punch?) I colored the cute image with Copics and added some glossy accents. Sponged the sky blue and added some beads to the snail's eyes. Matted this on red cs with a punched edge. Finished with ribbon, rhinestone bling, punched butterflies and a sentiment. Annabelle Stamps: Use sketch shown above right and bling. 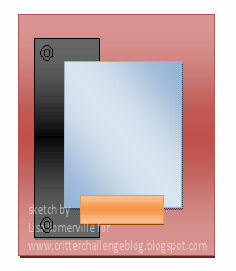 Critters Challenge:Use the color red and striped patterned paper somewhere on your creation. Image: Paper Cupcakes "Joyful Ride"
Hope you have a joyful day! Thanks for ridng by. 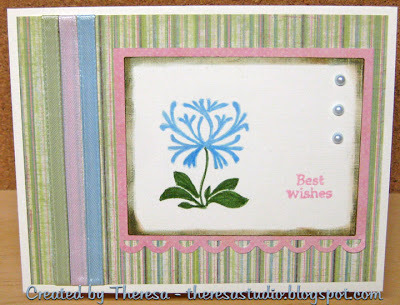 At Simplicity, Susan's One Layer Challenge this week is to use a border stamp on a card. 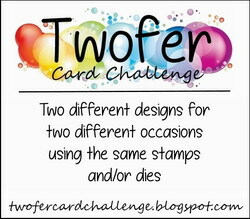 Use a border stamp or, if you don't have a border stamp, either create one by repeating a small stamp. Remember to keep embellishments to a minimum. I have a stamp set from Martha Stewart that has some border stamps that I have never used so I inked one of them with some Memento Paris Dusk and stamped this very simple border on a white cardstock. Added some score lines with my Scor-pal. 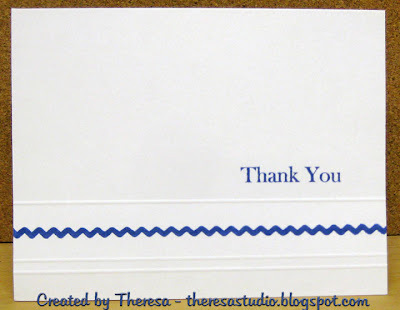 Stamped the Thank You from a new set from Mark's Finest Papers "Thankful Mums and Pumpkin". 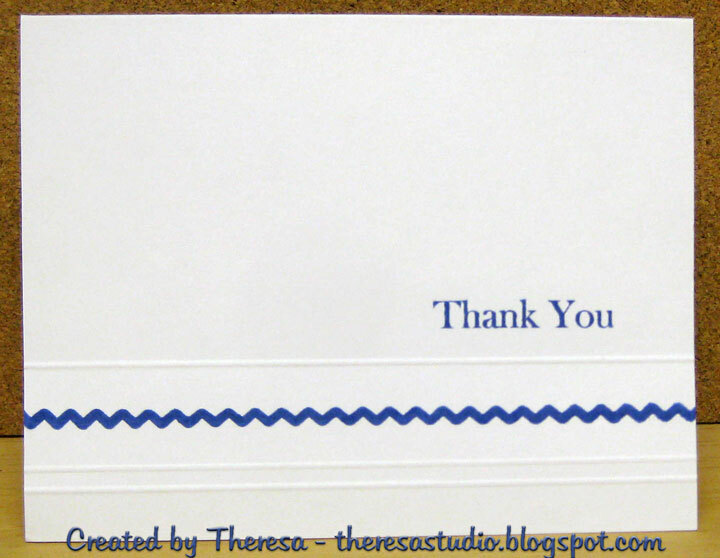 Like the navy color with the crispness of white card stock...nice change from my black and brown ink that I use so much. Love these simple challenges but it does take some planning and the execution must be flawless since you cannot hide mistakes with layers, etc. This card was made from a design shared with me by my friend, Dianne. Stamps: Mark's Finest Papers "Apples and Camellia"
I decided to enter this in Speedy the Cat's Friends Challenge since it does have a fruit and autumn theme. 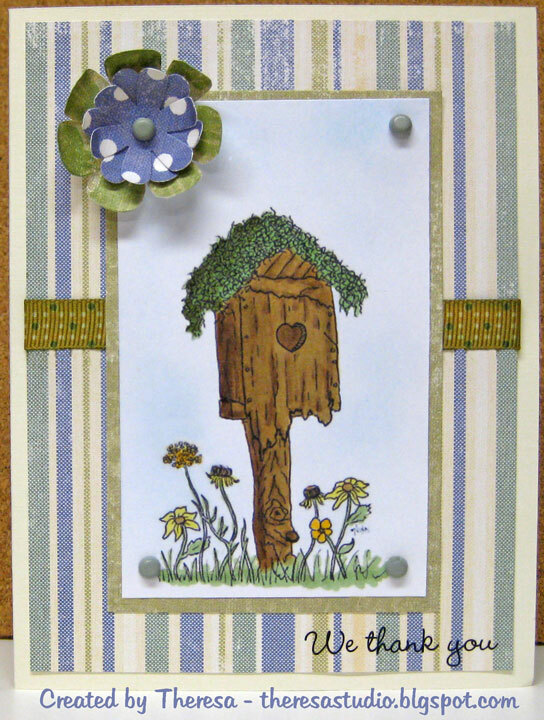 Geri's challenge is to make a Harvest card - any way you want, colors, fruit, flowers. I have not done the challenge at AllSorts for awhile but thought I'd give it a try this week. 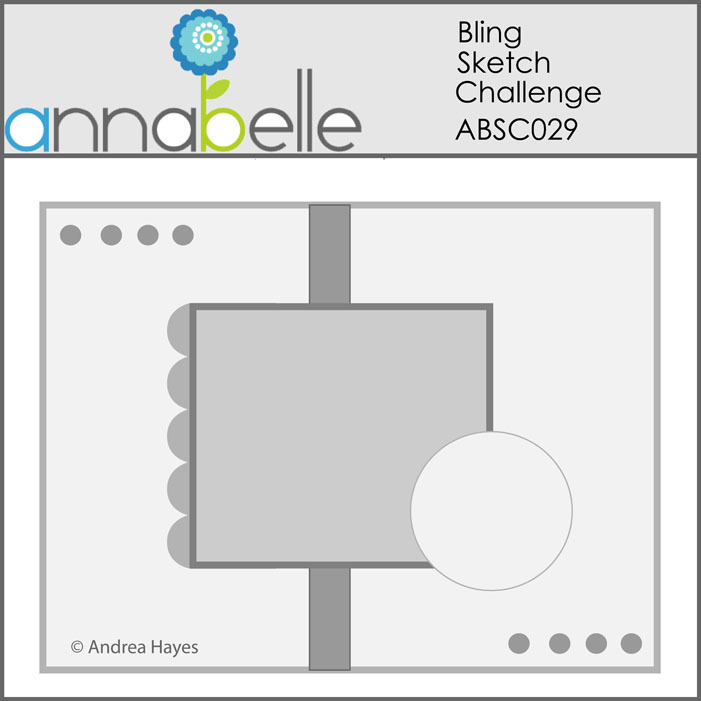 Amanda challenged us to make something less than 3" in size! I had this stamp on my desk and a scrap of CS close by so I did a quick and simple card. I added the adhesive paper ribbon as a border. How easy peasy is this. Laid out the ruler so you can see it is less than 3". 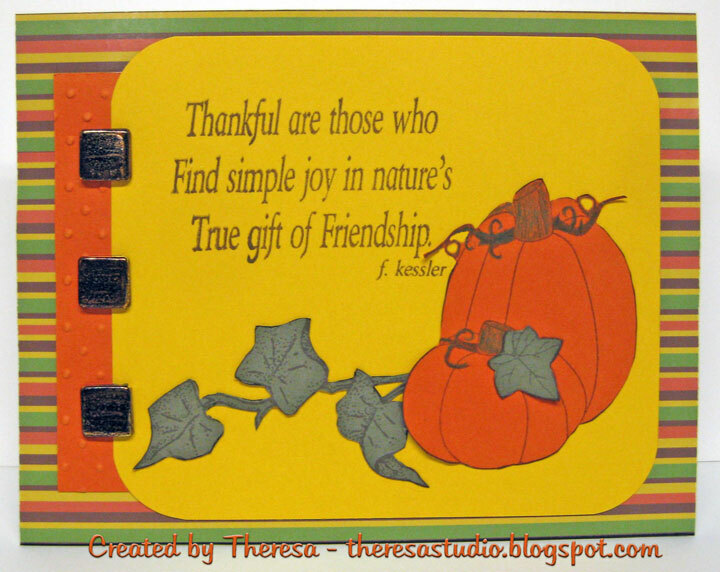 Stamp: Mark's Finest Papers "Thankful Mums and Pumpkins"
This week at Speedy the Cat's Friends Blog, Geri has challenged us to make a Harvest card - any way we want- colors, fruit, flowers,etc. I decided to ink up the stamp that I received this week from Mark's Finest Papers as a prize from their blog hop. 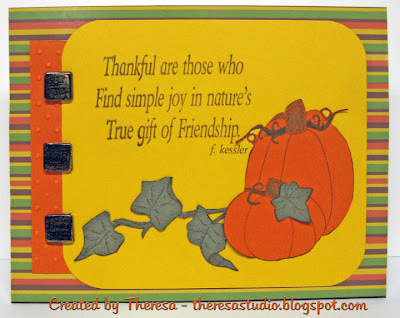 The pumpkin stamp is perfect for a harvest card and I paired it with an Ivy stamp that I have had for years and never used. I stamped the pumpkin on orange paper and also on green for the leaf. I stamped the ivy on green also using brown ink to stamp. 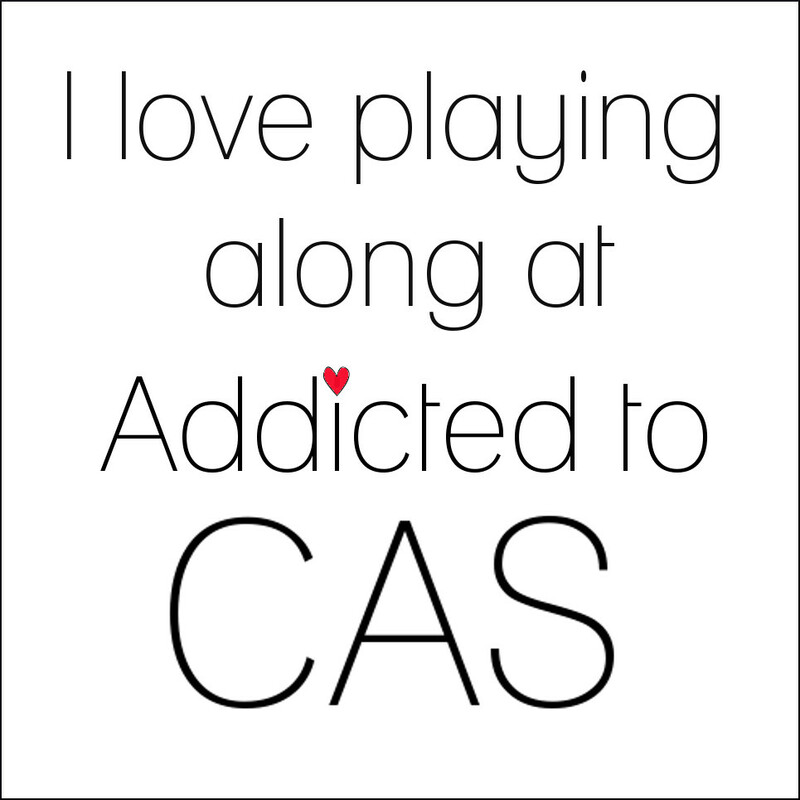 I cut the images out and placed on yellow cs. Stamped the sentiment with brown also. Following the sketch from Card Sketches at CPS, I finished with a stripe paper and solid orange. Added metal brads that I colored with brown copics. Papers: Stripe is GKD Digital "All About Autumn"
Have been behind on commenting and challenges this week. Maybe I willl catch up soon. I love butterflies and fall colors so combined these faves together. 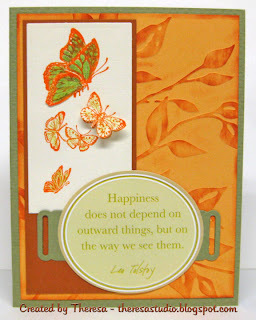 I did this card for several challenges that included colors of olive, rust, and orange, a quote, a sketch, and butterflies. have a butterfly,fairy, or angel on it. Sentimental Sunday: Words to inspire. Hope this card might inspire you to look for happiness. 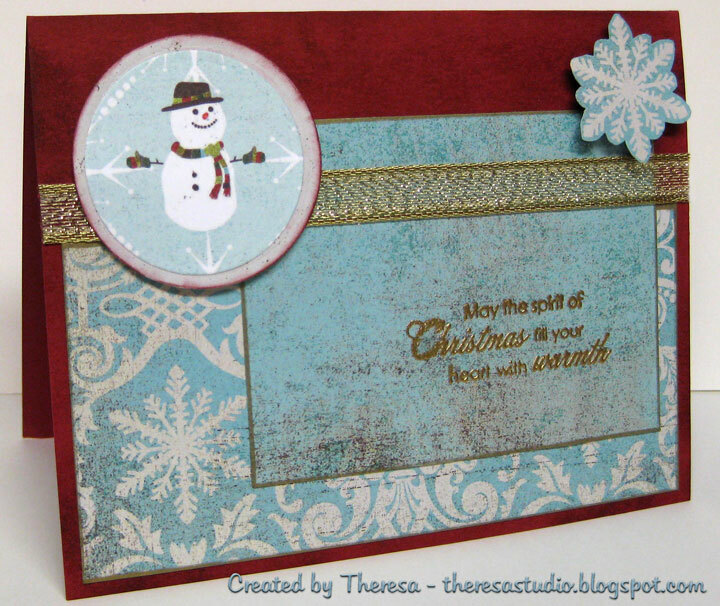 At Stamp TV, Giovana challenged us to use up some scraps in a Christmas card. Since I never throw anything away I had plenty of scraps from which to choose. 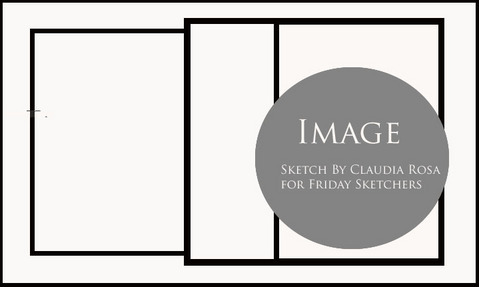 Used the sketch on the right for the layout. Christmas Cards All Year Round: August challenge is snowflakes. Quickly posting this to try and make deadline for the challenge at Lili of the Valley which is the sketch challenge on lower right. Made this card with the LOTV image of "Two Presents". Colored with Copics and added some sparkle with a glitter pen. Papers are Basic Grey Olivia and K&CO. Used base card of white. Ink is Memento Rich Cocoa and Pilot Gold Marker. Used pink stickles on hat. 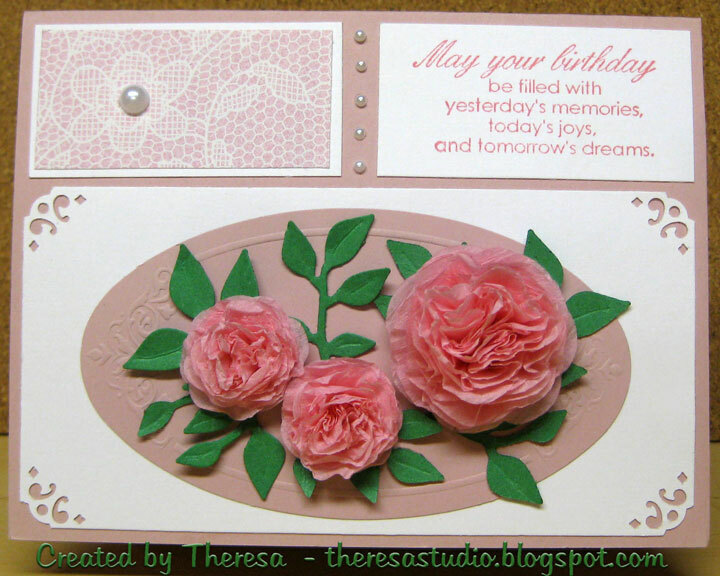 At There's Magic in the Air, Gloria Westerman brings us the challenge to use any acquired image by Paper Cupcakes and to make any type of flower/flowers and then use it/them on your project. It can be made from paper, material, crocheted, etc. 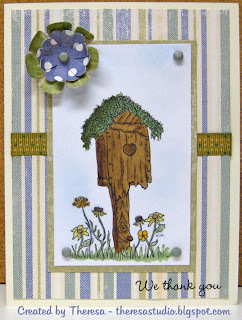 I used the image Moss Topped Birdhouse from Paper Cupcakes and colored the image with Copics. I sponged the sky with Memento Summer Sky ink. I matted this on a greenish pattern paper and placed on a striped mat on a base card stock of ivory. Used ribbon and brads from stash. Made my flower with by punching coordinating papers and attached with a brad . The sentiment is a Karen Foster Rub-on. 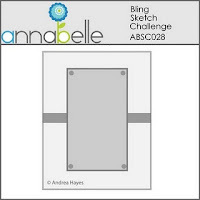 I followed a sketch from Annabelle Challenge. I love the look of this birdhouse. Have had the image for awhile and this is first time I have used. 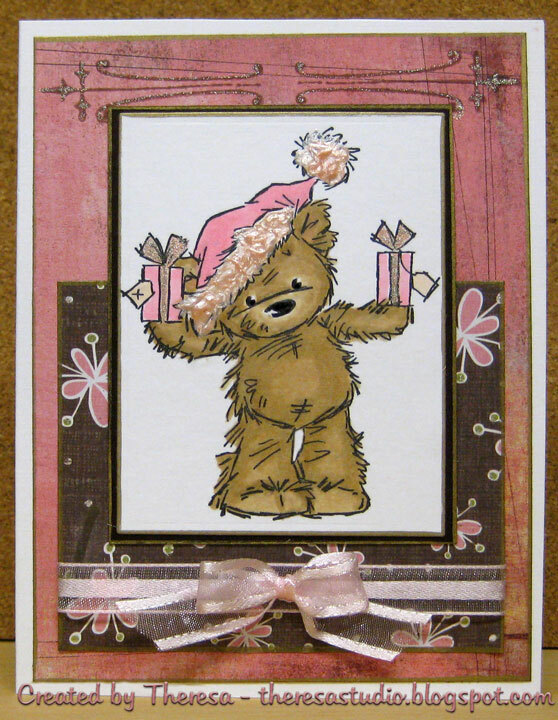 At Stamp TV Carla's challenge was inspired by the beautiful colors of GKD cardstock: Passionate Pink, Lipstick Red, Innocent Pink, Wine With Everything and Black Onyx. 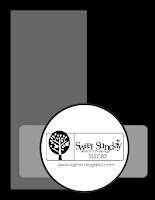 We can pick any combination of these colors for our card. 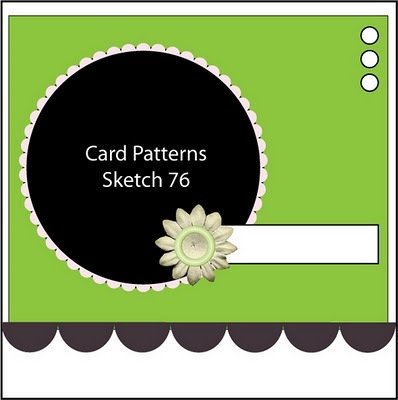 I chose to use Innocent Pink, Lipstick Red, Black, and Cranberry Tart GKD Card Stocks for my card. 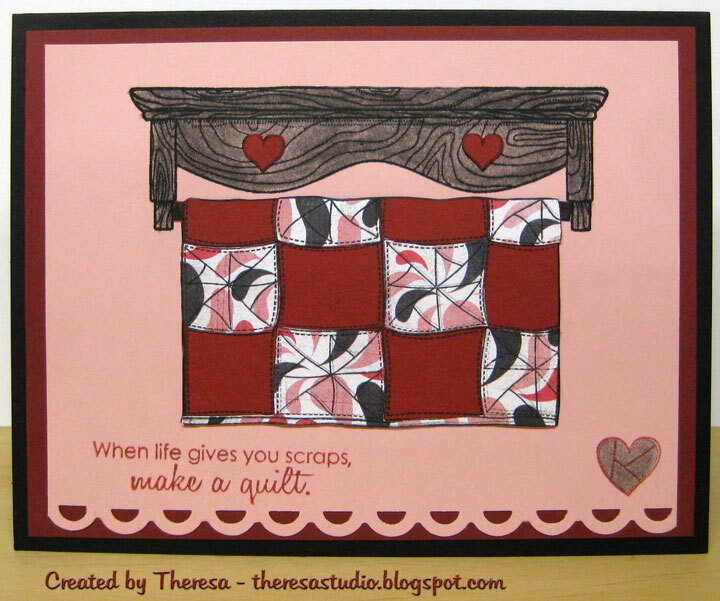 I used stamps from GKD "Nana's Needlework" by Nina and stamped the quilt in black on Lipstick Red cardstock and paper pieced with a pattern paper from Basic Grey "Olivia". I stamped the quilt holder in black versafine on the pink CS and added the quilt that I cut out. I colored the holder in black pencil and OMS. I paper pieced the hearts with the red CS. 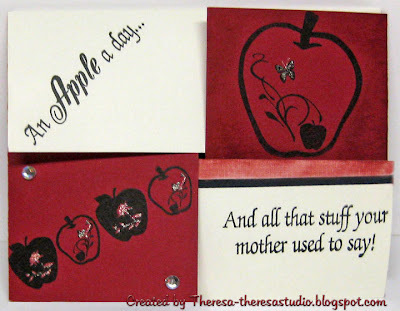 I used the sentiment stamped with Memento Rhubarb Stalk Ink. Added the heart stamp in Rhubarb Stalk ink and colored also in black pencil and OMS. Pink Mat is punched with a Fiskars Scallop Punch. All is assembled on a mat of wine and the black base card. 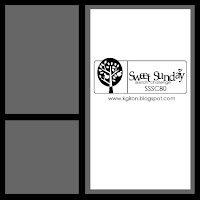 At Simplicity this week, the challenge is to do something simple and one-layered with a scene. The hardest part of these challenges is deciding what to do. 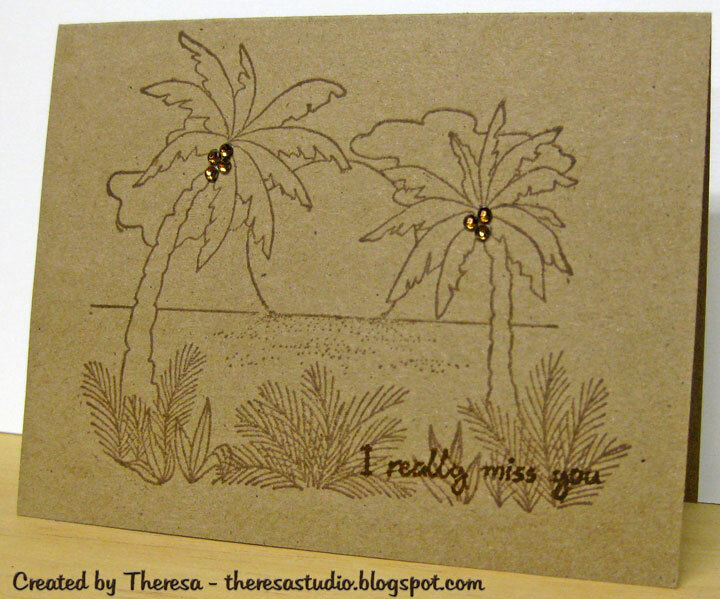 I have a new stamp "Sunset with Palms" that I won from Just for Fun Stamps and decided to do a scene of the beach at sunset. 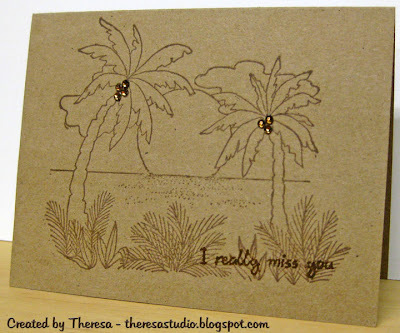 I just simply stamped on kraft card stock and added some "rhinestone" coconuts in the palm trees....no coloring of the scene. Added a sentiment but almost wish I had not...maybe should have stamped a little lower? 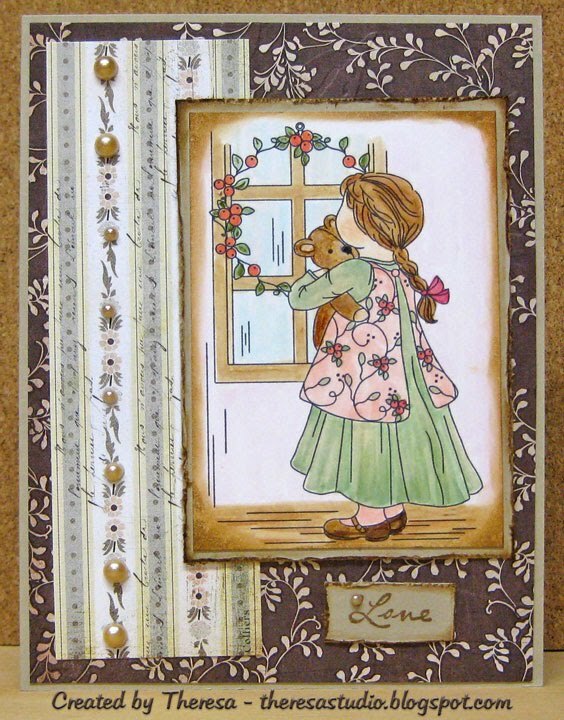 Used Memento Rich Cocoa ink and Creative Clear Stamp "Hello Hunny" for sentiment. That's all folks! 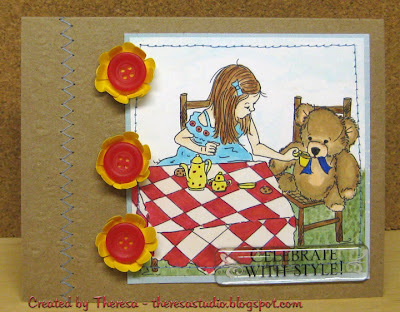 At Teddy Stampers, their challenge is to create a project with the theme of......Teddy Bear's Picnic! Today's the day the teddy bears have their picnic." I made my picnic card with a digital image from Sassy Cheryl that I colored with Copics and did in an outdoor setting. I stitched this to a mat of blue and attached this to a base card of kraft. Added flowers that I punched out and use buttons for the centers. Did some stitching on the side of card. 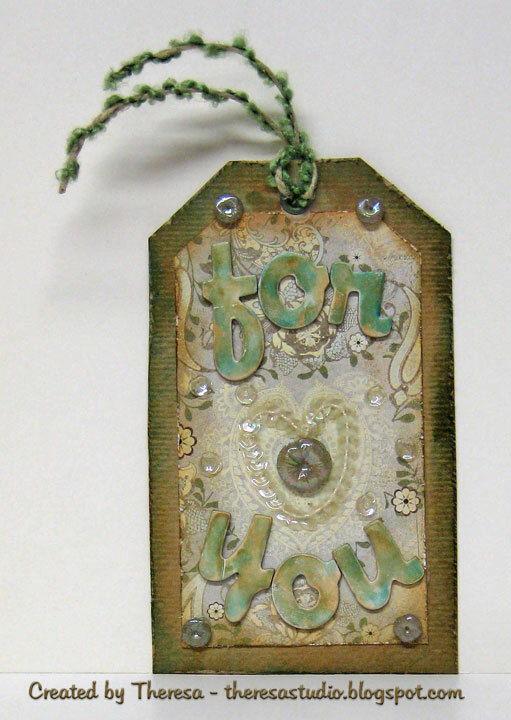 Used a sentiment that is a clear stick on from Cloud 9 Designs. 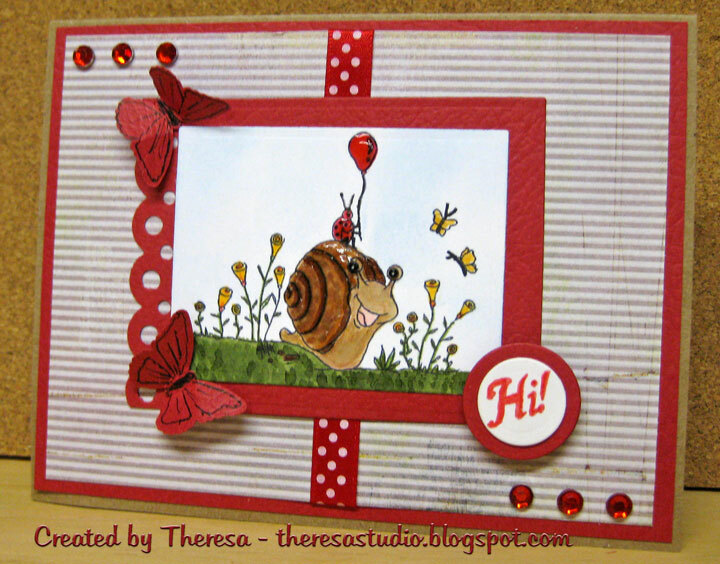 For the One-Layer Wednesday Challenge, Susan asked us to mix it up this week by using unexpected color schemes on a one-layer card. Your card may be any theme you like, but use colors in a fresh, new way and do something wacky. I decided to do Christmas colors of green and red on a Thanksgiving card. This might make one forget about Turkey for Thangsgiving and save a turkey. (Attempt at humor there). I stamped the turkey and colored it with Copics and the sentiment was stamped by inking directly to the stamp. In hindsight I should of made the turkey red not brown. Oh well! Added some score lines with Scor-pal. 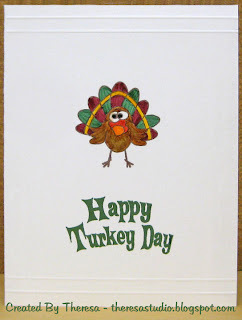 Stamps: Creative Clear Stamps "Turkey Day"
One Stop Craft Challenges had a theme this week for projects with the theme ORIENTAL DELIGHTS. I learned how to fold a kimono with paper in one of my Stamp Club meetings last year. This was inspired by a exhibit of Kimonos made by Itchiku Kubota at the Canton Museum of Art....a beautiful showing of his textile art of kimonos. Photos of his work can be found here. 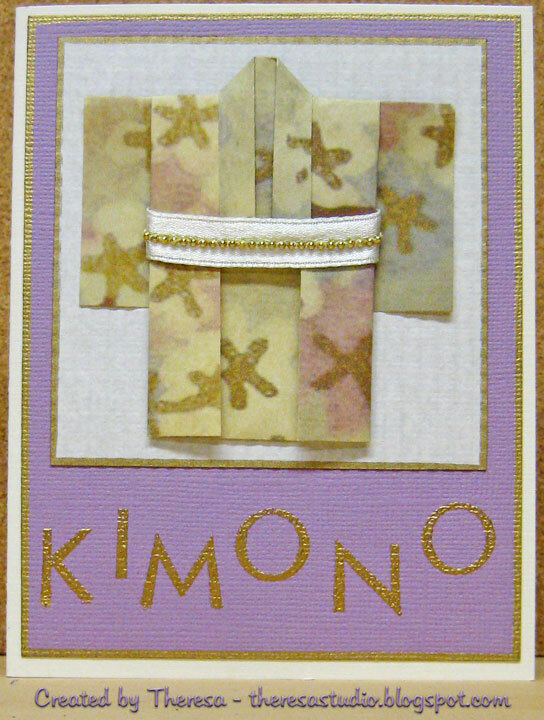 I folded the kimono from a paper I downloaded and then trimmed it with a ribbon with gold beads. Attached this to a mat that I edged in gold and placed on a mat of lavender also gold edged. Used a base card of ivory. Fun to do this fold again for this oriental card. 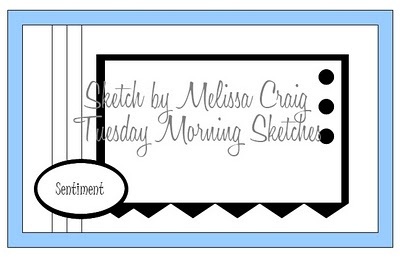 Melissa's sketch this week at Stamp TV is a circular design as shown lower right. I cut a folded circle and matted on a scallop circle of green CS. I stamped the floral design on a smaller circle inking the stamp directly and matted this on a green circle and surrounded with the cut out swirls. Added a strip of pattern paper and pearls to complete the card. Going in circles with this challenge. 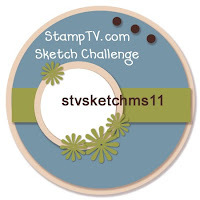 The colors this week are pink, blue and green for Carla's challenge at Stamp TV. 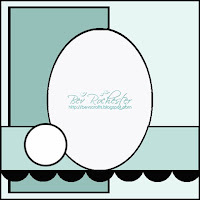 I used her color combo with a sketch from Tuesday Morning Sketch Challenge by Melissa Craig. Entered card in both of these challenges. I inked stamps directly with markers. For Joan's Gardens' challenge this week, make a purple and green card using a strip of patterned paper. Some kind of butterfly embellishment is required too. 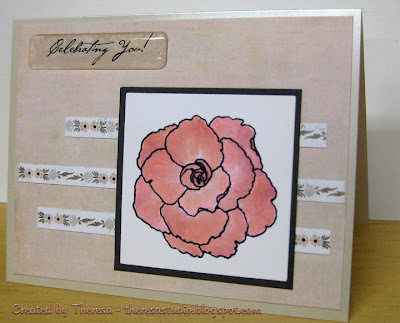 I used the sketch from Flourishes Timeless Tuesday Sketch Challenge (FTTC79) and one of my Flourishes stamps that I won.! I stamped a branch stamp from Flourishes and cut out with a circle die letting the branch extend beyond the edge. 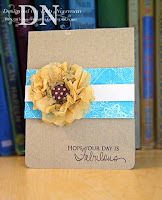 I added flowers that I cut with a Sizzix die. Used green and purple papers and a pattern paper for borders on the sides. Also dry embossed purple backgound. Finished with a butterfly brad and stick on sentiment. Flutter by Wednesdays: Open challenge, just be sure to have a butterfly, fairy or angel on your creation. 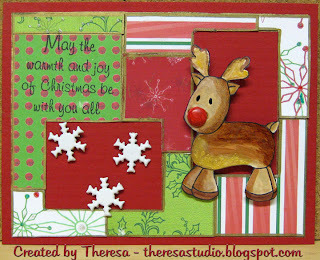 At 2010 Christmas Card Challenges the week's challenge is a color combo. The combo is deep red, black and cream/vanilla which are so elegant looking. 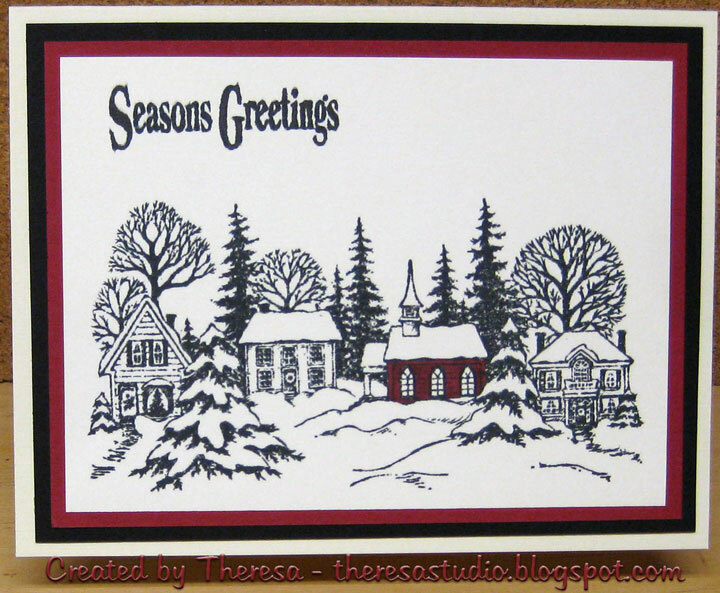 I used a very old stamp "Christmas Village" by PSX who are no longer around. 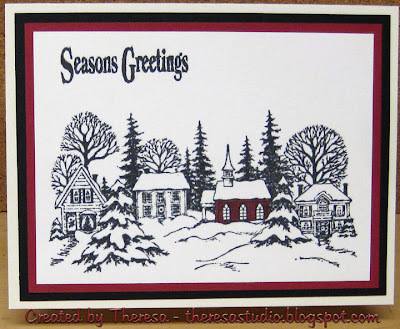 I stamped this on cream CS with black ink and colored in the church with a copics. Matted on black and red CS and placed on cream base card. Added sentiment to finish. Cute Card Thursday: This week we want to see your cards that feature trees or leaves on them. I used something old...the PSX stamp. Copics and Paper are new. 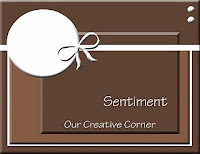 Creative Clear Stamp "Holiday Sentiments"
At There's Magic in the Air this week, Dru brings us our challenge; Lets do some sewing!! 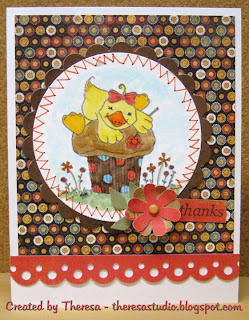 She would like us to use the freebie image "Just Ducky" provided by Paper Cupcakes and to incorporate some sewing into your project/card. 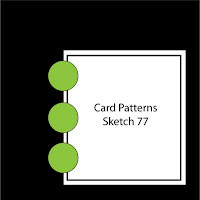 I used Card Patterns Sketch 76 for my card. Printed digital image and colored with Copics. Cut with circle die and stitched to a scallop circle of brown. 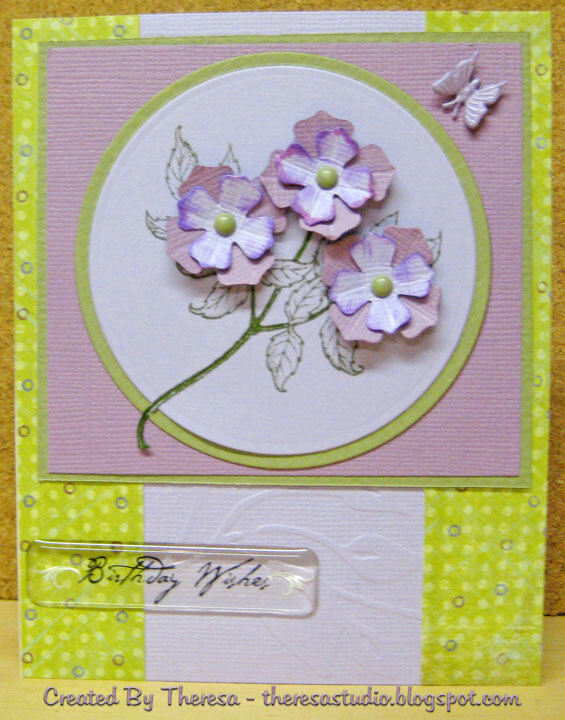 Assembled card and added flower I made. Image: Paper Cupcakes "Just Ducky"
At Just Cute Bears, this week's challenge is Bear and Me....use images with a bear and someone else. I chose an Inger Harding digital image of a girl holding her bear in front of a window. 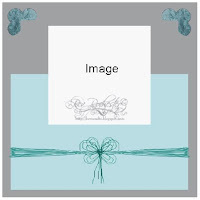 Please check out Inger's great digitals which are free to download. I colored the image with Copics and distressed the edges with ink and placed on a distressed mat of soft sand. I followed a sketch from Critter Sketch Challenge using patterned papers as background on a base of soft sand. Finished with a touch of pearls. Image: Inger Harding "Waiting for Santa"
I love this image from Inger Harding and enjoy all her work. Becca is the daughter of Giovana who has been doing the Christmas challenges at Stamp TV and is a very talented card maker. 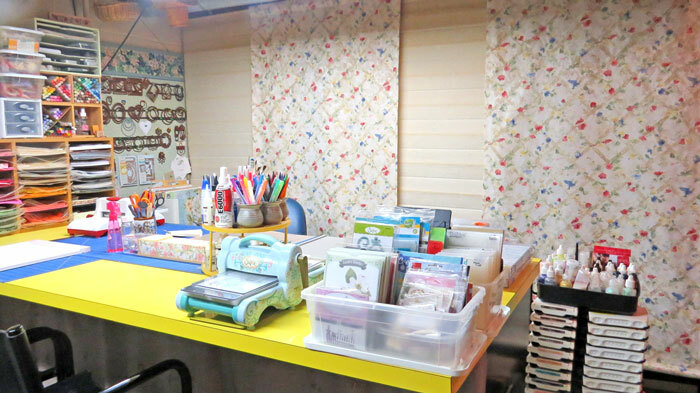 Her daughter, a budding crafter, enjoys doing challenges that are posted on Mom's blog "A Place to Praise and Craft". Check out the details and more about Becca on her mother's blog. I enjoy seeing someone so young taking an interest in crafting. 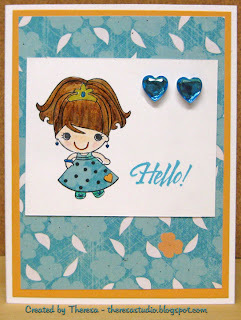 I made this card just for Becca using this sweet girl stamp and followed her sketch adding a sentiment and some bling. I paper pieced the dress and colored the rest with copics ...have to work on doing hair. Added some glitter to jewelry and tiara. Stamps: Your Next Stamp "Party Fiona"
I enjoyed your challenge, Becca. 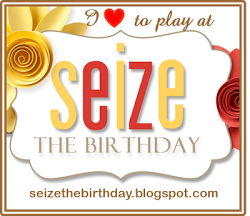 Hope you are having fun with it and receive many entries. Good Luck with your crafting. At Stamp TV, Giovana challenged us to use punches and/or dies in our Christmas project. I used the Cuttlebug die to cut out ornaments that I stamped and heat embossed with gold EP. 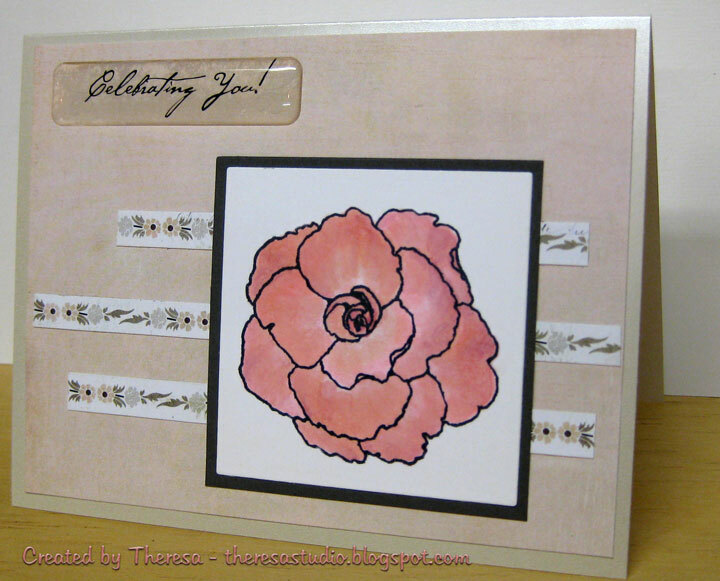 I made a background for the card by embossing and sponging the raised design with ink. 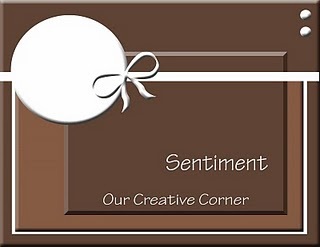 Our Creative Corners: Use embossing. 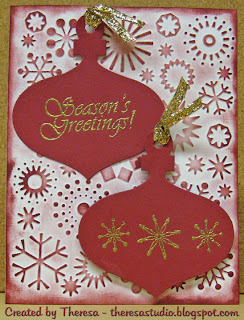 Cuttlebug: Ornament Die "For You"
This week's challenge at Lili of the Valley is to use a sketch by Bev to make a card using a LOTV stamp. I used the stamp "Little Star" but changed the star in his hand to a snowflake to go with the embossing on the background. I colored him with copics and stickles. Cut the image out and place on the oval mat of red. Focus of this card that I made for a challenge by Linda at Stamp TV and for the challenge at Joan's Gardens are the crepe paper flowers that I made. Cut the petals for the flowers using Spellbinders Blossom die and inserted brads in center to hold together. 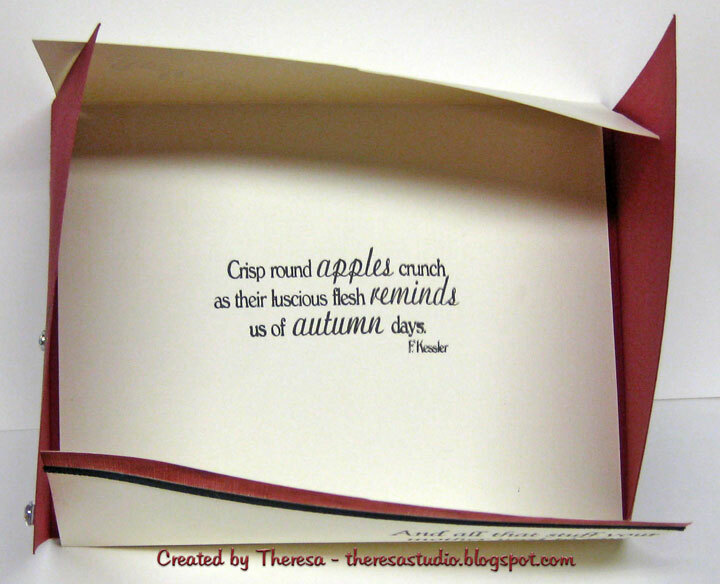 Cut leaves with a Sizzix die. 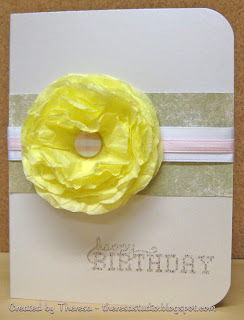 Placed the flowers and leaves on a precut oval that I had left from a scrapbook project. Put this on a white mat that I decorated the corners with a punch. Following a sketch from Sweet Sunday which I turned on the side, I stamped a sentiment on one rectangle and a "Lace" Paper on another. Assembled card and added some pearls. 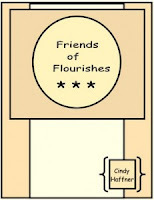 Joans Gardens: Make a pink and white card, and be sure you have 4 corners punched preferrably with a Martha Stewart Punch-- if you don't have any, you can substitute something else. Stamp TV Blast Challenge: Make your own Flowers and give us at least three flowers on your project. 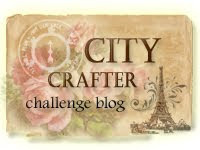 Speedy the Cat's Friends Challenge: Make your own embellishments. Stamp Something: Be inspired by the photo. I was inspired to make a birthday card with pink. 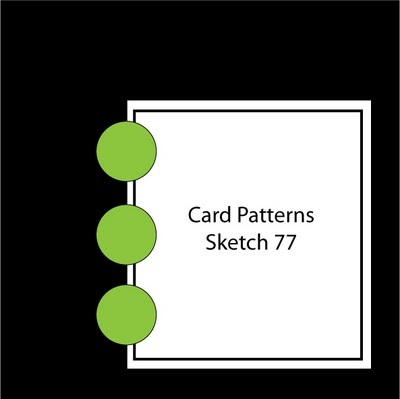 Stamps: GKD "Inside and Out"
At CAS-tastic Challenges, this week's challenge is to CASE the Design Team. I always have a hard time caseing a card but decided to try anyway. 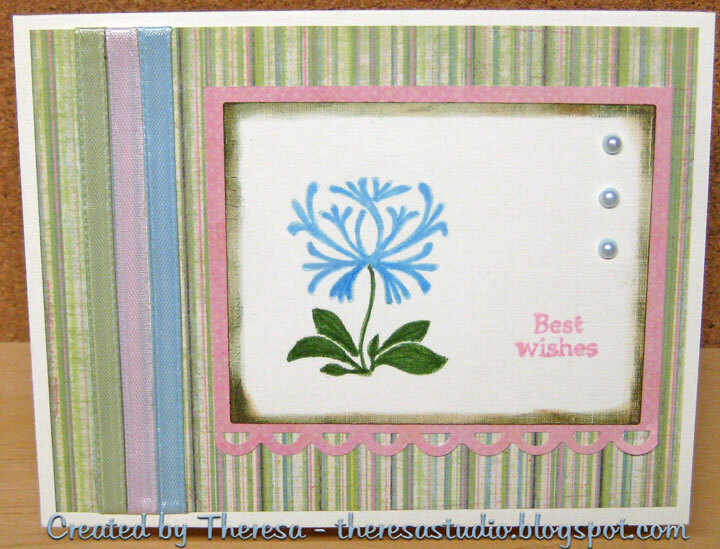 I chose the card made by Deb and you can see her card details at her blog. 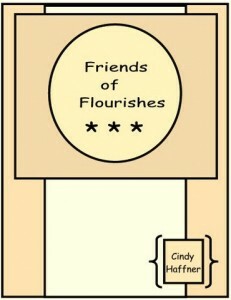 Loved the simplicity of the beautiful card and flower. Photo of her card is shown lower left. Made the flower using tissue paper from my wrapping station. I had this great checked brad and matched up some pink and white ribbon. Was out of Kraft Paper so used another CS from my stash. Thought this pattern paper went well with the oyster pearl cs ......finished with the sentiment. Craftalicious: Make your own flowers. Thanks to Deb for allowing us to CASE her lovely card...hope I did it justice!